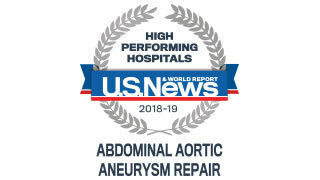 UT Southwestern Medical Center earned High Performing recognition for abdominal aortic aneurysm repair by U.S. News & World Report for 2018–19, placing us among the country’s leading hospitals. The majority of abdominal aortic aneurysms are asymptomatic. An aneurysm may be discovered by X-ray, computed tomography (CT) scan, or magnetic resonance imaging (MRI) that is being done for other conditions. Pain in the abdomen, chest, lower back, or groin area is the most common symptom of an abdominal aortic aneurysm. The pain may be severe or dull. Acute, sudden onset of severe pain in the back and/or abdomen may represent a rupture and is a life-threatening medical emergency. Abdominal aortic aneurysms may also cause a pulsing sensation, similar to a heartbeat, in the abdomen. 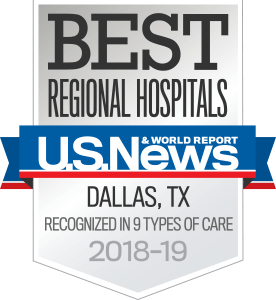 At UT Southwestern, our vascular specialists use computed tomography angiogram (CTA) scans to show detailed images of our patients’ arteries. They use these scans to choose the best treatment approach. Our specialists review patients’ comprehensive medical data to evaluate how an endovascular stent procedure compares with traditional surgical options or determine if a combined approach is needed. Depending on the patient’s overall health and specific condition, our specialists will recommend the appropriate procedure. 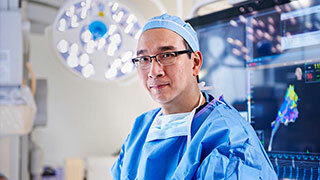 UT Southwestern’s Advanced Endovascular Aortic Program focuses on treating complex aortic diseases using total endovascular therapies that are minimally invasive. Led by Carlos Timaran, M.D., the team has developed a Physician-Sponsored Investigational Device Exemption (PS-IDE) protocol, which we have used since 2014 to implant fenestrated and/or branched stent-grafts. With these devices, our vascular surgeons can repair most aortic diseases, such as complex suprarenal and thoracoabdominal aortic aneurysms and chronic dissections, using this minimally invasive approach. Our endovascular aortic approach is appropriate for most patients, even those who cannot have open surgery, providing a faster recovery. In addition to the fenestrated devices, we are working with other, similar devices to bring the latest, evidence-based treatment options to our patients. In the UT Southwestern Advanced Endovascular Aortic Program, we have treated more than 500 patients with fenestrated and/or branched devices since 2007. Our team is committed to the highest quality of care and excellence in outcomes, achieved through our extensive expertise and adherence to rigorous clinical research methods. Currently, Dr. Timaran and his team are the only vascular specialists in the Southwestern U.S. with access to all devices for the true total endovascular repair of all aortic diseases. If patients are eligible for an endovascular stent procedure that allows a more rapid recovery, the surgeon will use live radiological images during the procedure to guide a catheter through a blood vessel to the location of an aneurysm. Patients who are not candidates for an endovascular stent procedure might require an open repair approach. 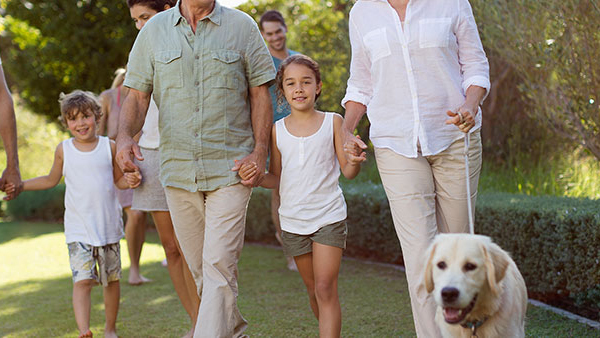 Our vascular surgeons will discuss the entire procedure with each patient and explain how traditional surgery offers the best possible treatment. Led by Melissa Kirkwood, M.D., our Complex Open Aortic Surgery Program features renowned vascular surgeons who treat advanced problems including aorto-enteric fistulas and removal of infected aortic stent grafts. 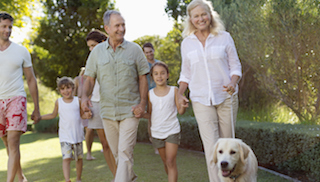 We offer the full spectrum of open and endovascular aortic care. Whether endovascular or open surgery is the best option, our vascular specialists have the expertise to provide the right treatment for each patient’s specific condition. Our physicians' dedication to excellence in vascular surgery gives all our patients the compassionate and advanced medical care needed to effectively treat an aneurysm. A vascular surgical technique pioneered at UT Southwestern and designed to replace infected aortic grafts with the body’s own veins has proved more durable and less prone to new infection than similar procedures using synthetic and cadaver grafts. 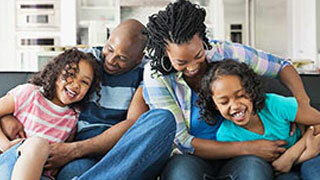 Search for opportunities to participate in a clinical research study.